All-New Stamping specializes in stamping complex, high precision metal stamped parts and components for a wide range of industries. Our experienced staff will work with you to manufacture a part that meets your exact requirements. From selecting the best material and the most effective tooling to manufacturing a finished precision part, we have the expertise to ensure that your part will be manufactured to your exact specifications and to the highest quality standards. We stamp metal parts ranging from small precision parts, such as electronic equipment and musical instruments, to large precision components, including processing equipment and architectural components that are decorative and functional. 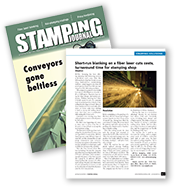 All-New Stamping has the capability to work in quantities from prototype runs to full production runs. With over 40,000 sq. ft. of manufacturing space we have the capabilities to offer you a complete turnkey metal stamping solution. Our wide range of metal stamping presses from 10-ton to 150-ton offer our customers the flexibility to take care of the most demanding requirements. Custom tooling designed and manufactured by All-New Stamping's tool and die department, including single stage, compound and progressive dies. Our staff will work with you to develop the most effective tooling to manufacture your part based on the material, complexity of the part and the quantity required. A wide range of materials, including steel, aluminum, brass, stainless steel, sheet metal, copper, brass, plastics and specialty metals. All our materials are traceable, with full certifications. We can provide environmental statements if required. With over 60 years in the business and our AS9100 , and ISO 9001 certifications, we are perfectly positioned to work with you to maximize your production dollar. At All-New, our customers come first, and our core values of listening to you and delivering a high quality product the first time and every time to bring added value to every part we produce.